TFX calls for a 100% online control. Indeed, no one is immune to process drifts. Thanks to control system, customer and supplier relationships can greatly be improved with objective figures. Sample taken in the case of injection, can be all or partly transposed to most industrial needs. The control of the process is carried out independently by the modules. These can be loaded on the equipment, attached to the press or integrated into a mobile control. The modules interact with their environment by reporting deficiencies: incomplete parts, risk of burns, risk of frailty in welding line, over or under-heating on the threshold or channels. The PC is only there to collect traceability data and to allow analysis. Everything is available for a continuous optimization and a strong commitment to quality. Aim:	Automatic detection of short shots and injection defects. Applications: Technical parts or large series with high quality requirements. Heat flux sensors are sensitive enough to detect without direct contact heat transfer between the material and equipment during injection. The amount of heat measured is directly related to process parameters and quality of filling of the footprint. Applications: Optimisation of quality of technical parts. Changes in viscosity of the material are generally not sufficient to generate quality problems. However in some cases where parts are very complex, where the process is pushed to the extreme (high rates, temperatures), residual variations greatly complicate the task of adjusters. Variations are much more pronounced when using recycled material. The injection is routinely accompanied by heat related to shear and friction. This heating is also directly related to the viscosity of the material. Control of temperature changes related to the matter in heavy loaded zones (channels or threshold), provides access to these variations and help to optimize settings. In thermosetting injection or compression, detection of heat released by curing reaction can be used for automatic "just in time" press opening. This approach reduces cycle time while ensuring reproducibility of cure level. Indeed, natural variability of these processes (related to startups, thermal regulation, storage time and handling...) limits cycle time reduction. To produce at optimum in given conditions, the cure time has to be adjusted for each part in order to avoid quality problems like uncontrolled bad smells. 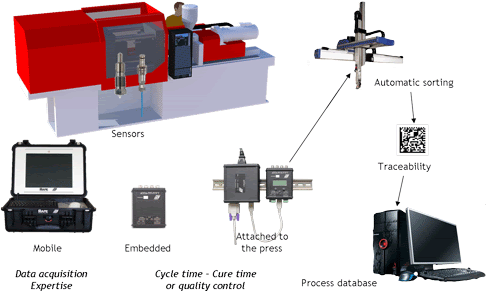 Aim: Non intrusive detection of resin flow front and cure monitoring (cure start and end). Applications : R&D, Vent control, Optimisation and Production traceability. Heat flow sensors measure the heat produced by curing reaction injected resin. This measurement makes it possible to monitor in real time cure behaviour for each part produced and enable automation of curing cycle by end of cure detection. Aim: Non intrusive resin flow front detection in stoves, cure monitoring. Applications: R&D –optimisation, quality insurance. Infusion of resins into reinforcements induces small thermal changes which are detectable with high sensitive of heat flux sensors. It is now possible to monitor resin flow front and resin cure even under caul plates or thick membranes. The monitoring of thermal gradients in Pultrusion dies makes possible to detect and control exotherm peak position in real time. Such a system ensure optimum productivity of a line with a constistent cure level.